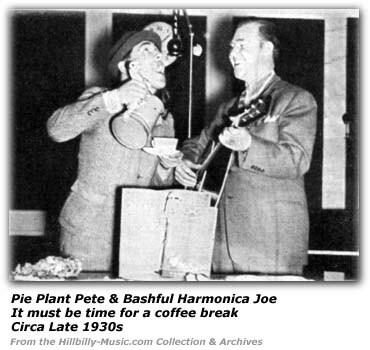 Fans knew this popular duo as Pie Plant Pete and Bashful Harmonica Joe. They each had their own career prior to meeting up one year. Pie Plant Pete was really a fellow named Claude Moye, born in Shawneetown, Illinois. Bashful Harmonica Joe was born Joseph Troyan in Pleasant City, Ohio. Pie Plant Pete took a liking to music at a very early age, learning not only the guitar, but also the harmonica and would wear a shoulder brace so he could play both at the same time. When he was just about 20 years old, he left the family farm to try his luck in Chicago. 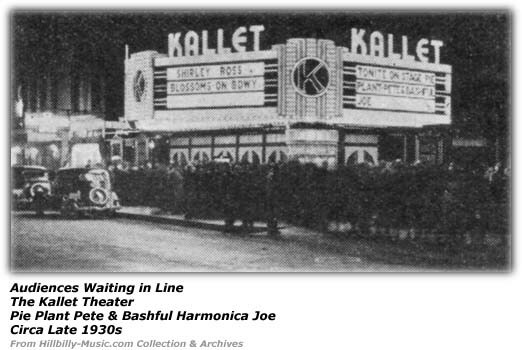 He auditioned for WLS on May 4, 1927 and he must have did well, for his musical career had started. WLS was a popular station in those days and other stations would sometimes raid the station's roster for talent. After a couple of years, Pie Plant was offered a job at WTAM, a radio station in Cleveland, Ohio. The National Broadcasting Company put him on its nationwide network for fans coast to coast to hear and he began to receive fan mail by the thousands. 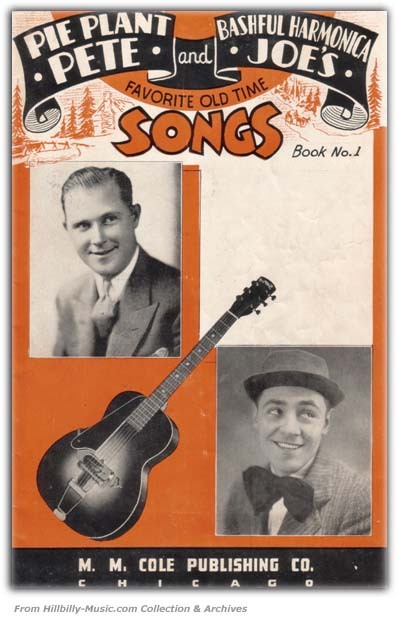 Their M. M. Cole Song Folio from 1937 pointed out that Pie Plant Pete had received over 500,000 pieces of fan mail in the ten years he had been on the air up to that point. The booklet indicates some insight as to how he got that name. We had one fan of theirs tell us that "pie plant" referred to rhubarb pie. Pie Plant himself used Shakespeare to explain it. "What's in a Name? A rose by any other name would smell as sweet," but there's no other name like Pie Plant Pete! If you don't believe it, just try to say it quickly. More than likely you'll say Pie Plant Plete, and the laugh one gets from trying to say that tongue twisting name certainly makes one remember it. And that's an excellent reason for choosing such a name; a name that is hard to say but easy to remember." However, Mary Jean Shurtz wrote a feature article about the duo for the old Mountain Broadcast and Prairie Recorder magazine in June of 1946 and we hear a bit more of the origins of his name. When Claude was at WLS in Chicago, it was a bit of a custom for folks such as program director, Harold Safford and musical director, Glenn Rowell, to provide a name for the station's acts. In this instance, the two of them were browsing a catalog and saw a picture of a pie plant and they knew that Claude already had the nickname Pete, so, they combined everything and he became "Pie Plant Pete". During his work in Cleveland, his popularity was such that other stations sought to air his work. We found an old New York Times blurb that touts the arrival of Pie Plant Pete over radio station WEAF at 8:00am each day for a fifteen-minute show that originated in Cleveland. What is interesting is the prose the writer injects into this short article introducing the New York listening audience to Pie Plant Pete (but the radio station listing lists him as Claud W. Moye) and perhaps shows its regional bias and the way it viewed the musical styling. For instance, describing his musical tunes: "His songs are the type that originated in the hill country of Scotland when the traveler's tales were set to music and told in ballad form. As the travels widened, the ballads lengthened. Many of them came to America and are still sung in the cabins of the south. Others more commonly heard by the present generation came into being because of mere happenings." It even interjects an example of the wreck of the old '97 as such an example. That article then goes on to describe Pie Plant Pete's style: "...comes naturally by his talent for injecting the drawl of the mountain folk into his songs, the whisper of the pine trees into his guitar strings, and the barn-dance spirit from his harmonica." The article does point out that Glenn Rowell of the duo, Gene and Glenn and station manager at WLS was the one that heard his audition that day in 1927. But we learn that while Pie Plant Pete was working in Cleveland over WTAM, he met up with Bashful Harmonica Joe who was appearing on Lum and Abner's Friday night show at the time. The two guys got to know each other and started doing personal appearances together. They found that after doing a series of appearances together while Joe was on vacation that they decided to become a permanent team. So, let's learn a bit about Joe. It was said he could imitate just about any type of animal found on a farm and fool the animals themselves. He also took a liking to music and when he got his first 25 cents, he got himself a harmonica. When Joe was sixteen years old, mom moved the family (seven boys and one girl) to Cleveland. Joe entered an amateur contest one day and his harmonica playing earned him the first place prize. He also did his barnyard sounds as well as imitating the stars of the day such as Ed Wynn, Steppin' Fetchit and Herny Armetta. Joe auditioned for a Cleveland radio station and earned a spot on the air. 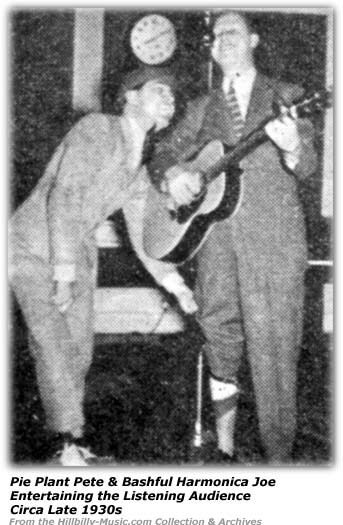 After three months on the air, Rudy Vallee came to town on a talent search and Joe ended up being one of the seven winners Rudy picked and encouraged. Bashful Harmonica Joe hooked up with Lum and Abner when they decided they needed a harmonica player for their backup orchestra for their Friday Night Sociable. Joe's package of talent and energy got him the offer on the spot. Another popular country music entertainer of that era came through Cleveland during that time and heard of Joe's talents - Bradley Kincaid. He offered him a spot in his touring group and Joe went along on a tour of the south and middle west for about a month in a series of one night stands. That led him to work at a radio station WBZ in Boston, Massachusetts for a time. 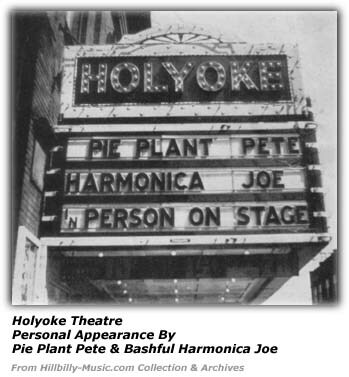 It was around the summer of 1936 when Joe took time off for a vacation that Pie Plant Pete asked his friend to make a few personal appearances with him. The instantly clicked and decided to make it a permanent arrangement. That led to a 10-month stint on WBZ in Boston. How did he get the nickname, "Bashful Harmonica Joe"? His early personal appearances gave him a lot of stage fright. He swallowed so much that his little black bow tie would bob a bit absurdly up and down, he would cling to the drapes and act like a shy kid appearing in public for the first time. The audience laughed at this sight and Joe decided to make it a permanent part of his act, even after he learned to deal with his stage fright. Bashful Harmonica Joe related in a 1994 interview by the Plain Dealer in Cleveland that he remembered the first time he ever saw his name 'in lights' as an entertainer. He was doing a show in Huntington, West Virginia and many fans of country music will recognize the name of that town and the roots it has to many a performer. The 1994 article also brought to light the fact that Joe was invited to perform at one of the first public television broadcasts in Cleveland on May 9, 1932 at the May Company department store. One interesting tidbit the song folio notes - he was an avid photographer and was said to have made a photograph of every major league baseball player in the American and National Leagues. That would be one heck of a baseball photo collection! Bashful Harmonica Joe always kept his mom in his thoughts as he traveled in his career. He would faithfully send her a picture postcard from every town that he worked in. His mom saved all those cards in albums. That would be an interesting way to follow his career if one could turn the pages of those albums his mother kept. Art Kelley featured the "...two rustic sod-busters if there ever were two" in a 1938 article. At the time, the duo was entertaining fans over WHAM in Rochester, New York six days a week at 7:15am. 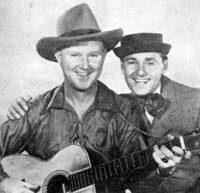 They featured "cowboy and hillbilly songs, harmonica solos, duets and novelties; gay humor and amusing imitations." In 1939, the two of them registered for the draft. Shorty after that, Pie Plant Pete found himself serving his country at Fort Francis E. Warren in Cheyenne, Wyoming. But a law was passed that meant men over the age of 28 were discharged from serving. Pete went back to Cleveland and the boys continued to entertain the fans. But in 1942, it was Joe's turn to serve and he left to join the United States Army air forces. He entertained the troops throughout the western and southwestern United States at the time and traveled thousands of miles from his home base in Las Vegas, Nevada. During his stint with the All Soldiers show based in Hollywood, he got to meet such stars as Mario Lanza, Alice Faye, had dinner with Gene Autry, danced with Ava Gardner and swapped stories about Cleveland with the legendary comedian, Bob Hope. However, upon returning from one trip, he hurt his knee and had to rest a while; shortly after he was discharged. He returned to Cleveland. Pete had started working at a war plant. They joined forces on the radio again over WJW. Around that time, they introduced a new character to their act called "Guppy"; it was a part played by Joe. While Joe was on the west coast, he appeared in a movie called "On The Beam", but is apparently not in the credits. The movie is also known as "It Comes Up Love" according to one national movie site. The movie was released in 1943. In a bit of irony, "Pete" noted that he had left the family farm because he didn't exactly like getting up early in the morning. But when he got his first job on the radio, he had to be there at 6:00am! If you think back to the time of 1938 and the country perhaps edging its way out of a great depression, it makes you wonder of the cost of musical instruments back then. The 1938 article notes that Bashful Harmonica Joe had spent over six hundred dollars on harmonicas in the previous six years. But perhaps to remind himself of his humble beginnings, he always carried the first silver dollar he earned. 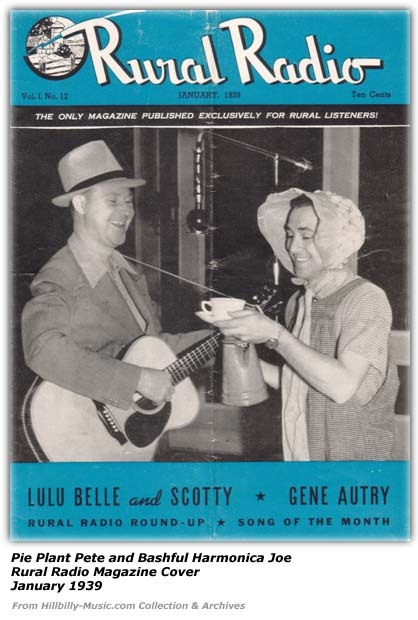 There popularity was such that they were featured on the cover of Rural Radio magazine in the January 1939 issue. 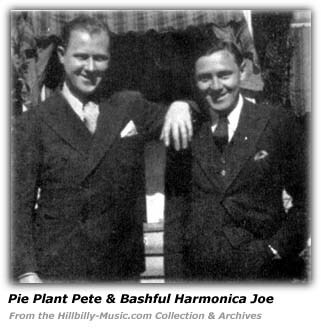 In 1946, Arlie Kinkade tells his readers that Pie Plant Pete and Bashful Harmonica Joe were over the air on radio station WJW in Cleveland, Ohio. A transcribed show was also airing in Toledo, Ohio as well over station WSPD. In the summer of 1946, the boys started doing personal appearances with several other acts. Al Hendershot was the emcee for the troupe. Salt and Peanuts, a famous husband wife act at the time and Slim Carter were the other performers. 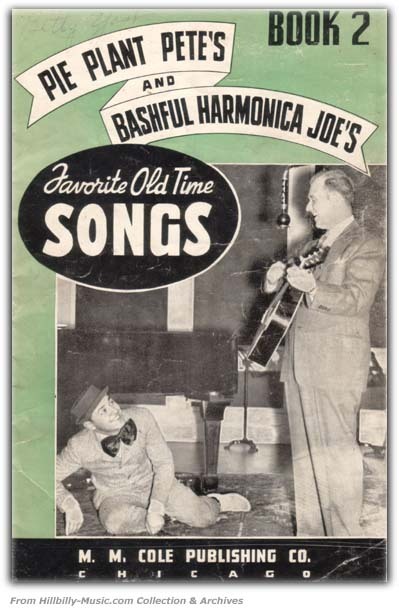 Mary Jean Shurtz wrote in one of her "I've Been Listenin'" columns in early 1947 that she had heard from Bashful Harmonica Joe. He told her that their show on WHAM got them letters from fans in 26 different states and Canada. In December of 1946, their air time on WHAM changed to 6:30am to 7:00am and were on Monday through Saturdays. Then on Saturday, they also did a 9:15am show, sponsored by Lee's "Save the Baby". Around Christmas time that year, Joe went back home to visit with family. Pete stayed behind and did the two morning shows. We learned in a December 1946 article that the duo had just left Ohio at the end of 1946. They toured a bit around the east coast, met with a former sponsor for a few days, talked with recording companies and thought they'd have a few records out before too long, then headed south for a time, visiting various radio stations. They eventually found their way to Nashville, the home of WSM and the Grand Ole Opry. No mention was made of whether they appeared on the show, but she did mention that Bradley Kincaid had them on his radio show. When they got back home to Ohio, they found that they had a couple of offers from other radio stations. One was from WHAM in Rochester, New York, a station they had worked at around late 1938 and 1939. When they first went back on the air at WHAM again in late 1946, the show was at 6:00am to 6:30am. And as for that vacation at the end of 1946, well, they wrote Mary Jean and told her that they had put over 7,000 miles on the car. Mary Jean also wrote for National Hillbilly News around that time with a column entitled "One Hillbilly Fan to Another" and here we learned other details in 1948 such as the boys were recording for the Process Records company. In another of her columns, she notes that Process Records was based in Franklin, Pennsylvania. She said she liked the records, especially "..the one with a lot of yodeling" but she couldn't remember the title. She did mention in 1948 that when fans would hear their recording of "Rooster Serenade", they might think they're listening at 'least' to a quintet. Early 1950 saw another new station for Pie Plant Pete and Bashful Harmonica Joe. Changes also came to the format of National Hillbilly News - a reduced size, but still containing a lot of details. Mary Jean Shurtz wrote again that she had heard from Joe and that they were on the air now at WJR in Detroit, Michigan, 760 on the AM dial and airing at 5:00am to 6:00am. She wrote again in the summer of 1950 that Joe had written again and told her that they had been featured in the July issue of Radio Mirror magazine. They were also doing personal appearances all around Michigan and there was a possibility of appearing in Angola, Indiana in the summer at the outdoor country music venue (probably Buck Lake Ranch). In 1954, Country Song Roundup notes that the duo was still on WJR though the show had moved to the 9:45am time slot. One of the benefits of doing our site is hearing from the fans who grew up listening to the folks whose history we are trying to document. Bart T. from the midwest relates via his wife's email that his mom loved music and she sang in the home. During the 1930's, she asked her husband to buy her a Philco radio much the way families want to buy a new television today. 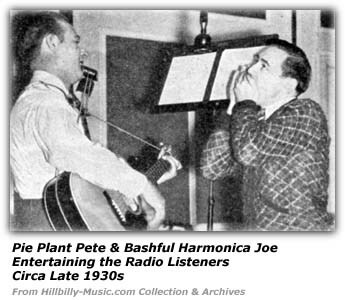 Every morning the radio was turned on so the family got to listen to Pie Plant Pete and Harmonica Joe. Bart remembers that as a child he learned to appreciate music in part because of this show being on his mom's radio. That got him to learn how to play a guitar and whistle. Bart says that, "Harmonica Joe was not just a singer, but he was a good inspiration, and during his radio programs, he enjoyed hearing him talk about his philosophy of life." In Joe's obituary we discover a bit of trivia - while in Rochester, he was once introduced by announcer Bill Wendell, who is known for the long drawn out introduction of David Letterman when his show opens. In a 1993 article, one of those 'show must go on' type of stories came to light from an era where getting to a personal appearance could sometimes be a story in itself. Joe rarely if ever missed a performance except for one night a snow blizzard struck and left him and 60 others stranded at a farmhouse. Being ever the showman, he put on a show for his fellow stranded new found friends and we're sure new fans. Joe's had some roots in the old vaudeville era. An example of his humor as corn ball as it may seem today is seen when it's mentioned that he would tell jokes about "roaming catholics" or "the Andy Song; you know, 'And he Walks With me' ". Joe Troyan's wife's name was the former Harriet Neumann, who was a school teacher when she first met Joe. They were married in 1957. He was also inducted into the Broadcaster's Hall of Fame in Akron, Ohio in 1991. "You make my day! You make my week! You make my year! You make my everything else!"